My Monday trend in blogging lately is to take a look at calming spaces. It helps start the week off right, don’t you think? Neutrals can be awesomely comforting when done well; a mixture of all shades of white, taupe, brown, gray, and black, coupled with a mastery of textures (woven, silky, grainy, shiny, matte, soft, and graphic) is a delight to look at. They’re pleasant to live amongst, too! Here are three perfectly serene neutral spaces that use strict neutrality and a plethora of patterns and textures. It’s not surprise that two of them belong to creative professionals! This space, home to beauty mogul Aerin Lauder, is one that my husband and I agree we could both live in. But really, who could say “no” to those views!? I love how they brought the snow inside via the light rug, and I adore the dark window detailing. 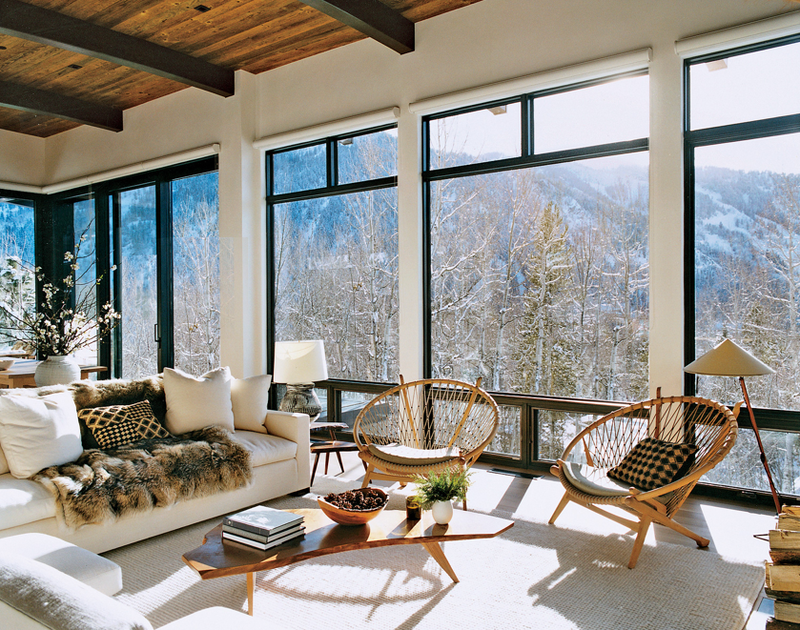 You can see the entire tour at “Mountain High: Aerin Lauder’s Aspen Home” in Vogue. This lovely, unexpected nursery belongs to Baby Collin, and was featured on Apartment Therapy Family. See “Collin’s Fresh White Room” for more. It’s brilliant to put textures and darker colors on the floor and curtains, because this will help make the room last as baby grows up (and gets messy). Truly, one of the more lovely and practical ways I’ve seen white used in a nursery. I love the mix of ethnic patterns with modern touches with Ikea basics. What a stunning compilation of items, that doesn’t break the bank! 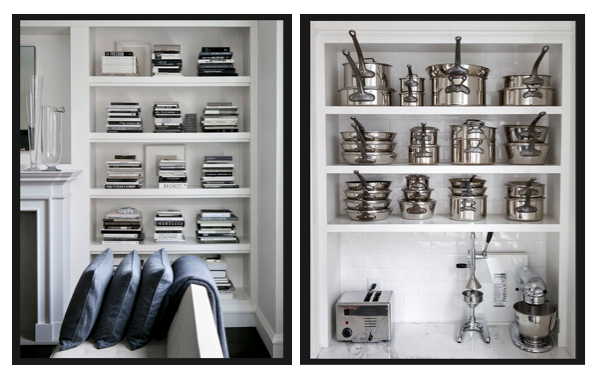 This meticulously organized and neutral apartment belongs to Todd Waterbury, an NYC creative director and brand consultant. These gorgeous photos come via the NYT article, “No Room For Mistakes” from this past January. I find the apartment beautifully successful because among all of the clean lines and blacks and whites, there is an element of warmth in the space thanks to a few wooden pieces that have moderate curves (if you peek at the slideshow, you’ll see it in the bench, chair, and a bowl). Gorgeous, right? Don’t you feel like you just took a yoga class? And as a bonus, this look is easily emulated on an extreme budget: just start collecting all of the moderately priced sisals and woven baskets and ivory twills you see at places like Ikea, Home Goods, and World Market, and you’re on your way! ← Color Friday is: Celadon! Thank you so much for sharing Collin’s room……it was fun to see it mentioned on your site. You have a gorgeous and very inspiring blog. Have loved browsing through your posts. You’re welcome, Rachel; it’s a great room! And thank you for the kind words!